Raith Rovers have appointed John McGlynn as their new manager. 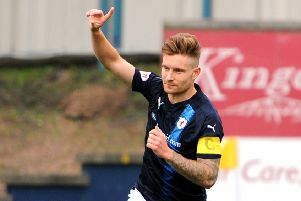 McGlynn (56) said he was “delighted” to return to the club for a second spell in the dugout having left Stark’s Park in 2012 to become manager of Hearts. Joining McGlynn – who quit his job as Celtic scout – is Paul Smith, once again taking up the reins as assistant at Kirkcaldy. “When I got the opportunity to come back I was buzzing,” said McGlynn, who also had a spell as manager of Livingston. “I’ve been out of management for about three years and that buzz inside never leaves you. Chairman Bill Clark said it was the combination of McGlynn and Smith’s experience combined with their love of the club that convinced the board to make its decision. “We’ve taken some three weeks and looked at the many applications that came in to the club and we decided to fall on the side of experience,” he said. “We think we’ve got the right management team together. “Another thing they bring is an identity with the club and we think that is very important. McGlynn revealed that he has not applied for any other management position during his time at Celtic, saying that Rovers was the only club he wanted. “I have a great feeling for the club and that’s partly why I’m coming back,” he added. “The fans have always been great with me. “Now they will expect the team to deliver between myself, Paul, the board of directors and the players, and we want to try and achieve that. “We’ve been over the course and distance before and we know what it takes. It won’t be easy. “But I came in here 12 years ago and Rovers were sitting second bottom of this league. We’re now sitting second top with only one team to go past.